In the 21st century, Adidas takes a lifecycle approach across the value chain to assess its impact. Raw material production has a huge influence on the company’s footprint: life cycle analysis shows that it accounts for half of Adidas’ total environmental impact, and 68% of the company’s overall water consumption. In order to improve performance and reduce impact, Adidas works with partners like DyeCoo to drastically reduce water use for textile dyeing, and the company is phasing out the use of virgin plastic, as well as rolling out a global product takeback program. Furthermore, Adidas has been experimenting since 2010 with 3-D printing to produce customized footwear that will also contribute to more demand-driven manufacturing. A possibly unexpected partner has grabbed the opportunity to join Adidas on its journey. Parley is the collaboration network where creators, thinkers and leaders come together to raise awareness for oceans and collaborate on strategies that can end their destruction. If we keep up the current trend, it is predicted that the oceans will contain more plastic than fish by 2050. Therefore, Parley has developed its A.I.R. Strategy (Avoid, Intercept, Redesign) to alleviate immediate threats to marine wildlife, to reduce the use of virgin plastics in product design, manufacturing and distribution, and to reduce overall plastic use. 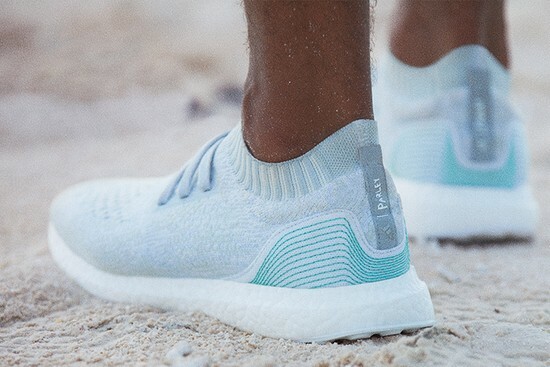 Adidas and Parley have started their partnership under the Ocean Plastic Program with a common goal: transforming marine plastic pollution into performance sportswear, which reduces the sourcing of virgin raw materials and addresses waste in the value chain. A collection infrastructure was established in the Maldives, and Parley’s main supply chain partner in Taiwan got on board for production. In November 2016, the first commercial products made with Ocean Plastic were introduced in a big launch with home jerseys for two of its biggest football teams: Bayern Munich and Real Madrid. The Value Proposition Design for the Circular Economy model (refer to the download) departs from establishing the desired impact with a concrete target, following the logic of the waste hierarchy. For Adidas and Parley, the impact to be addressed is the environmental footprint of raw material production (prevention, minimization) and cleaning up the ocean (recycling), with the target to produce one million pairs of Adidas shoes made with Parley Ocean Plastics in 2017. 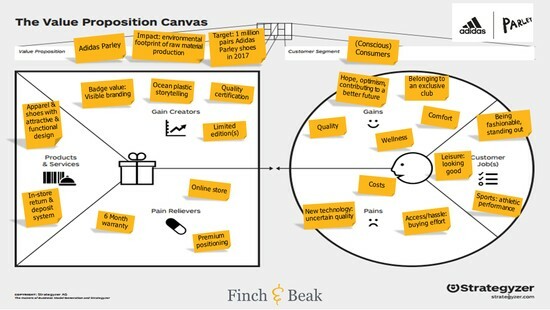 Taking a consumer perspective, we have made our own interpretation of the value proposition that will enable Adidas to help customers do their jobs, enhance their gains and relieve pains (refer to the value proposition canvas in the images top left). Adidas' core product offering is apparel and shoes for leisure and athletic performance. An attractive and functional design is key for both application areas. As a gain creator for "belonging to an exclusive club", Adidas can reinforce external recognition of its products with visible branding using the Parley logo, and storytelling about ocean plastics to a wide audience. Consumers that may have concerns about the quality of recycled materials could be reassured with a 6-month warranty on the shoes. The high(er) costs of the clothing and shoes could be re-enforced with a premium positioning. As a final step, we leave it up to you to think of what the business model could look like. Join in on the conversation and share your ideas with us on LinkedIn. 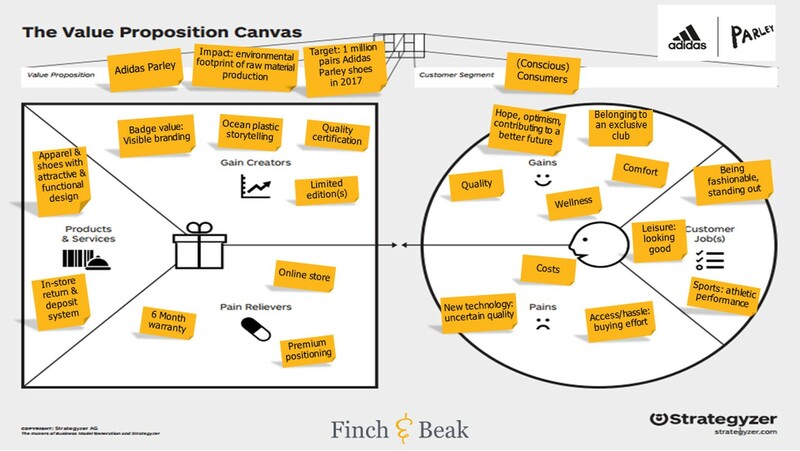 Interested in Value Proposition Design for the Circular Economy? 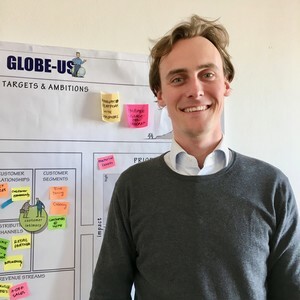 If you would like to accelerate circular economy programs within your company with business design thinking, the Circular Economy Sprint can help you get going. For more information, please contact Lars Gielen at lars@finchandbeak.com or call +31 6 28 02 18 80.